Saint Joseph tends to be the "bit player" in the Christmas story although his role was far more vital than just leading a donkey to Bethlehem (his ancestral town required by the Roman census) and asking for room at an inn. I thought about this when our local storytelling group, North Oakland County Storytellers regained a member, Ana LaRouche. The card with St. Joseph and the infant Jesus on the left was her Christmas greeting card to me. She's been living away from Michigan for a few years, so it was great to learn she's back. She's Brazilian, so her stories always have the bonus of that delightful sound. She's also found, with all the moving the past few years required, it was time to really get back into her art work. As a result I went searching for Christmas stories where St. Joseph had more than a fairly unimportant walk on. It's almost nonexistent! 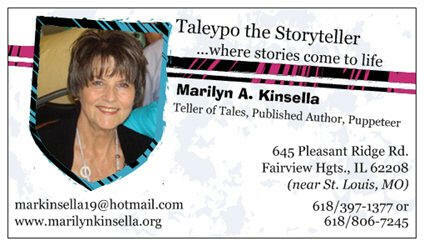 Almost, but not quite thanks to friend and storytelling colleague, Marilyn Kinsella. (Be sure if you go looking for her website you either use that hotlink or put her name in with a ".org" as there's yet another visual artist with the same name using the ".com" for her web address.) Marilyn's story can be found along with other Christmas tales worth telling on the wonderful Story Lovers World site created by Jackie Baldwin. That site remains available even though it can no longer accept additions. The Roman census I mentioned earlier happens a bit further in this story. Joseph doesn't appear right away, but is more important than in most stories of the first Christmas. With Marilyn's kind permission I give you this Christmas present of a St. Joseph story. Benjamin was a young orphan who lived on the dirt roads of his village. He never had much but somehow he always had just enough. You see, even as a young boy, he discovered that he had a special talent. He could carve. He could take any piece of plain wood and carve it into something other needed or wanted. “Benjamin, can you carve me a bowl for my mother?” “Benjamin, can you carve me a boat so I can play?” Benjamin could carve beautifully. So, the people would give him just enough silver. With the money he bought some food or clothes, but always kept enough to buy more wood. Well, as Benjamin grew, so did his talent. As a young man he started to build furniture. Most people in his village could only afford a table or a chair. But whatever his job, he always did his best. The people were very happy and paid Benjamin well for his work. Word spread and soon he had orders for his carved furniture from many different towns. Yes, it’s true. Benjamin did well in his business, but he never seemed to have enough money to set aside for his dream. And his dream was this. He wanted to carve a bed, a bed fit for a king. He wanted to order the finest mahogany wood and inlay it with ebony and ivory. Such a beautiful bed! He could see that bed in his mind’s eye. But everytime he put some money aside something always happened to take it away. Benjamin was what nowadays we call…an easy touch. Whenever anyone needed anything they came to Benjamin. “Oh Benjamin, did you hear? There was a terrible fire and the family across town lost their home. Can you help?” Oh Benjamin, my child is so ill. She needs special medicine, can you help?” And if Benjamin saw children homeless and cold, he gave them enough money to buy some food. Benjamin was so generous he never had any money left over. And so it went for many, many years. Benjamin working…but never saving any money for his dream. Years passed and Benjamin was becoming an old man. He was beginning to believe that his dream would never come true. Then, one year, miracles upon miracles, Benjamin did have enough money to purchase everything he needed. Unfortunately, Benjamin did not live by the sea. It would be a 3-day journey by foot to the nearest seaport. But, now Benjamin, more than ever, wanted to fulfill his dream. So, he prepared for his journey. He got himself a donkey and built a fine, strong cart. He would need that cart so he’d have a place to put the precious wood he bought. He put his silver pieces in a bag hidden under his cloak and headed out towards the sea. Benjamin walked on and on. It was even longer than he thought because the cart and donkey slowed him down. He was almost to the gates of the seaport village when some Roman soldiers stopped him. “Where are you going?” they demanded.“Well, I’m on my way to the seaport to buy some wood,” said Benjamin. “Where are you from and where was your family from?” they asked.Benjamin thought these questions were rather odd, but he knew he should answer their questions or they would probably throw him in prison. Benjamin knew there was no use in arguing. Besides he’d heard terrible stories about men being thrown in prison and never being heard from again. So, he turned himself and his cart in the direction of Bethlehem and continued his journey. As he walked along he noticed many others were also traveling to the homes of their fathers. It seemed, at times, that the whole world was traveling. He knew that his hardship was nothing compared to others. Once he met a small family. They were traveling with nothing to eat and no money. So, he dug out a few of his silver coins and purchased some food for them. Then someone needed to buy medicine more silver coins. He even gave away his donkey and cart to a woman who could no longer walk. Bit by bit his silver pieces dwindled and his dream of building that bed became dimmer and dimmer. Finally, he arrived at Bethlehem. He had just a couple pieces of silver left. He wasn’t worried, because he brought his tools with him. And if necessary, he would work for food and a place to stay. He went to an inn to see if there was any room. The innkeeper said, “All the rooms are filled. I have a closet where you could put down a pallet, but that is all.” He said he could stay, but he would have to do some odd jobs to earn his keep. “The animals out in the back are all over the place. The goats are with the cows and cows are scaring the sheep. I need someone to build stalls and feeding troughs for them. Can you do this?” Benjamin readily agreed. Finally he was down to his last pieces of wood and decided to do something extra special. He put the pieces together and even carved little animals on it. “I hope you appreciate all the work I do for you,” Benjamin laughed. But, when Benjamin helped Mary down from her donkey, he noticed she was great with child and that they didn’t have any blankets with them. He quickly excused himself and made his way to the plaza on the other side of town where he found a woman selling blankets. She was in no mood to bargain and made him pay his last silver piece. It was dark now, but strangely enough he had no trouble seeing for there was a strange star overhead. It lit his way as he made his way back across town to the inn. By the time he got back to the stable, he noticed that there were some shady looking men lurking about. He was sure they were going to hurt the young couple. But when he got close, he saw that they were shepherds and that were standing in awe and on bended knee. Then he saw what they saw – a beautiful baby boy was lying in the manger that he had just finished. He was wrapped only in swaddling clothes. He went over and placed the blanket on top of the child. 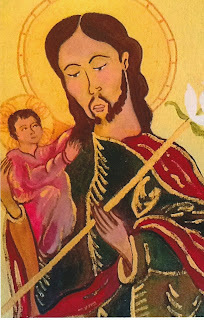 Go to Google Images for St. Joseph and you will find many traditional images of Saint Joseph with the elements of the infant Jesus and the staff of lily blossoms which inspired Ana's own version. My usual Saturday posting with the final promised public domain Christmas story will appear on the 26th, but before then I wanted to share with all of you my own wishes for you to have a merry and blessed Christmas, belated wishes for my friends who've cleaned up the last of the latkes from Hanukkah, and, looking off slightly into the distance with appreciation for the principles expressed in the celebration of Kwanzaa.